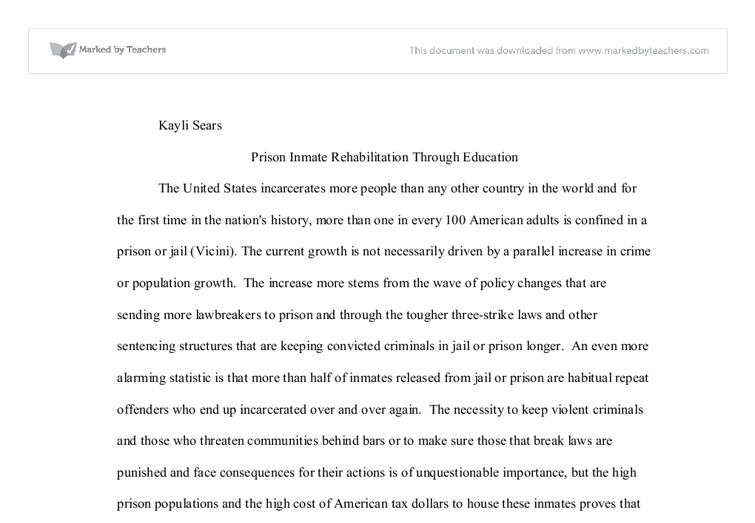 Kayli Sears Prison Inmate Rehabilitation Through Education The United States incarcerates more people than any other country in the world and for the first time in the nation's history, more than one in every 100 American adults is confined in a prison or jail (Vicini). The current growth is not necessarily driven by a parallel increase in crime or population growth. The increase more stems from the wave of policy changes that are sending more lawbreakers to prison and through the tougher three-strike laws and other sentencing structures that are keeping convicted criminals in jail or prison longer. An even more alarming statistic is that more than half of inmates released from jail or prison are habitual repeat offenders who end up incarcerated over and over again. The necessity to keep violent criminals and those who threaten communities behind bars or to make sure those that break laws are punished and face consequences for their actions is of unquestionable importance, but the high prison populations and the high cost of American tax dollars to house these inmates proves that there is a flaw in the system. No one seems to be benefiting in the long run. The high probability of an offender becoming a repeat offender once they are released is not an issue that can be ignored. Since the judicial programs can not seem to deter convicted criminals from returning there has to be some major flaws in the systems. ...read more. In addition by 1970 there were 25 states that college programs within their prison system. The main source of funding for the college programs was through Pell Grants, but beginning in the 1980's there were higher restrictions were instilled. Due to the Violent Crime Control Act that was passed in 1994 Pell Grants for inmates were completely revoked. If criminals were given more of an opportunity to realize that they could achieve a life better than the one that they led prior to being incarcerated there is a much less of a chance of them becoming repeat offenders. "Correctional researchers and administrators have long been aware of the strong correlation between low educational attainment and the likelihood of being incarcerated. 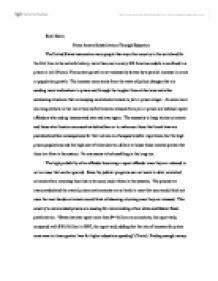 Recent research indicates that correctional education programs can significantly reduce the rate of reoffending for inmates when they are subsequently returned to the community." (From Cellblocks to Classrooms) Rehabilitation through education can have a positive affect across the board. Even though a person has committed a crime they should still be given the opportunity to become a positive and producing member of society. Inmates that are able to receive a higher education or even just obtain their high school diplomas are less likely to become repeat offenders. "One of the recent studies, conducted by the nonprofit Correctional Education Association with a grant from the U.S. Department of Education, examined the impact of prison education programs on recidivism rates in Maryland, Minnesota, and Ohio. ...read more. The chance at rehabilitation must not end there. Even though there are many programs that are in place to help inmates find work upon release they are still eluded profitable and successful positions because too many employers today instill strict background qualifications. Therefore even though an inmate may obtain a degree he is still left with the problem of finding an employer who we still hire them in light of their prison past. If inmates were offered the opportunity to have certain parts of their criminal past sealed in exchange for obtaining a higher education then this could be seen as a win win situation. So many convicted criminals will admit that their first offense was a huge mistake or maybe it was something completely out of their normal character, but it has such a permanent negative affect on their lives that they find themselves being forced into life a crime because whatever opportunities they had in life prior becomes stripped away because of one infraction that can be found on a background check. Certain offenses under certain conditions can be expunged from your record but, at cost of anywhere from $1,500 to $10,000 or more. The high cost can make it just about impossible for most. If those same people that would normally meet the criteria were given an alternative way to having their mistakes removed by obtaining a higher education then not only would they benefit greatly, so would society overall all. ...read more. He spoke of the indicated defences having the same limitation in a sense that if you do not do this the abstract would happen. In reciprocal to the integration of necessity into duress the main trigger as to the defence of necessity being individual came from the case of Re A (2000). Because of the decision of Burgess, he should have been allowed to either plead guilty to the offence, or use the defence of insanity. Instead, he successfully used the defence of non-insane automatism, which meant that the precedent in Burgess had not been followed. The court?s focuses more on the purpose of the statute and the intention of the legislature than the words before them. An example of a case that made use of the mischief rule is Elliott v Grey (1960), The Road Traffic Act 1930 stated it is a crime for an uninsured car to ?used on the road?. The History and Main Features of Criminal Law in the USA. These documents embodied the principles of limited government and the rule of law, which all were bound to obey. These ideas were developed in England and brought to the North American colonies in the 1600s. American colonists expanded their English legal heritage to provide new and higher levels of protection for the rights of the accused. July 2004, Tony Blair wrote that ?crime has fallen by 25%? ; this in itself shows the danger of only having one official source of data, and, whether or not the BCS is seen as a satisfactory alternative and supplementary source of data, it is imperative that we do not only rely on police recorded data. The use of vegetable oil is 'misleading' as although there was use of vegetable oil, it failed to mention that there was also use of animal oil in the food. Misleading is suggested to include cases where the defendant literally tells the truth; but not the complete truth.